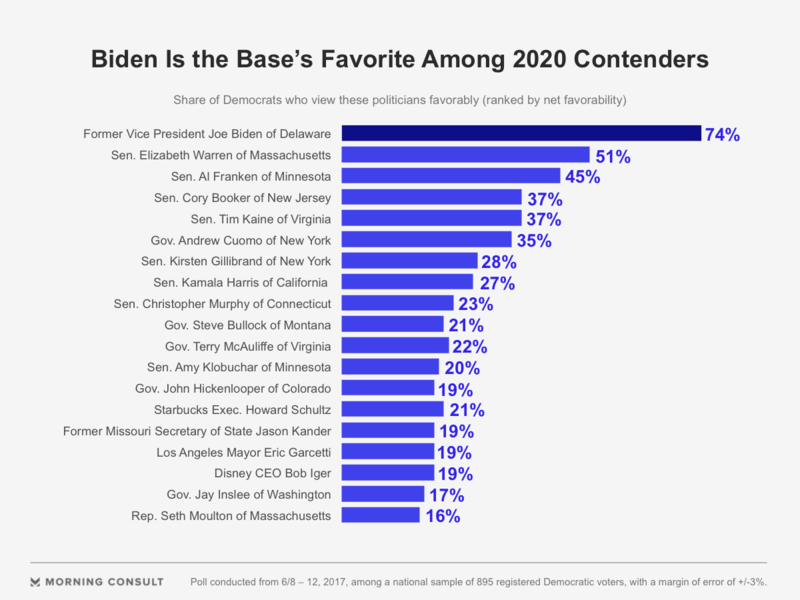 Among a current list of possible 2020 candidates, Massachusetts Sen. Elizabeth Warren is the most popular Democrat who is not named Joe Biden. A new Morning Consult/POLITICO poll found that just over half of Democratic voters (51 percent) have a favorable view of the progressive icon, well short of the 74 percent of party faithful who view the former vice president favorably. The June 8-June 12 survey asked registered Democratic voters if they had favorable or unfavorable view of 19 Democratic politicians who are viewed as possible contenders to challenge President Donald Trump in 2020 if he runs for re-election. The president has already started holding campaign rallies and informed the Federal Election Commission on Jan. 20, 2017 (Inauguration Day), that he had raised sufficient funds to qualify as a 2020 presidential candidate. Besides Sen. Al Franken (D-Minn.), a celebrity in his former career of whom 45 percent of Democrats have a favorable view, many other potential candidates are unknown by Democratic voters nationwide. Franken’s fellow Minnesota Sen. Amy Klobuchar, who visited Iowa in early May, is viewed favorably by just 2 in 10 Democrats — about the same percentage of Democrats (19 percent) who said they view former Missouri Secretary of State Jason Kander favorably. More than 7 in 10 Democrats (72 percent) said they had never heard of or had no opinion of Kander, the now-CNN contributor and voting rights activist who caught the national spotlight during his challenge to Republican Sen. Roy Blunt in 2016. The same percentage of Democrats had not heard of or had no opinion of Klobuchar, who has been building her national profile since she was elected to the Senate in 2006. Slightly better known than Klobuchar among Democratic voters is New York’s Sen. Kirsten Gillibrand. While 63 percent of Democratic voters said they did not know or had no opinion of her, 28 percent view her favorably. The other woman in the Senate whose name was tested, Sen. Kamala Harris (Calif.), a new face on the national scene, was viewed favorably by 27 percent of Democrats, while 66 percent had no opinion. Klobuchar’s Senate colleagues Tim Kaine of Virginia and Cory Booker of New Jersey were viewed favorably by 37 percent of Democrats, but half of them said they had never heard of or had no opinion of the two — the first a former vice presidential nominee and the second a man viewed as a rising star for the party ever since he was promoted from his popular mayorship of Newark. The survey is an early one — there are more than two years until the first-in-the-nation New Hampshire primary and Iowa caucus — and in the Trump era, big shifts in the conventional political calculus that guides many politicians can happen at a moment’s notice. But already, potential candidates are making moves to begin closing the gap of voters who have no opinion or do not know of them, hoping to move them to the “approve” column. Kander has sought to grow his national profile with a new organization called “Let America Vote,” which puts him on the ground in states such as New Hampshire. Harris has used her new job as senator to woo progressives and criticize the Trump administration in high-profile committee hearings. The survey, which polled 895 Democratic voters from June 8-12, has a margin of error of plus or minus 3 percentage points. A graphic in a previous version of this article misidentified the state represented by Moulton.